MEET Darryl Freeman, an executive celebrity chef who has been in the food preparation business in Zambia for quite some time. Darryl is of British descent. He grew up with his mother who became his inspiration. Growing up close to his mother helped him gain a passion for cooking, which eventually became his career choice. “The passion for cooking came from my mother who used to do a lot of cooking in those days when I was growing up. She baked cakes, cooked different dishes and I would always help her out in the kitchen with whatever she wanted to cook. That was when my passion for cooking started,” he said. When he was 14, Darryl went for a local boys scout competition in the United Kingdom (UK). It was a Best British Beef competition which he and his team won. Following the competition, his father encouraged him to become a chef as his skills were visible to the family’s eyes. After high school, Darryl attended Carshalton College, B Tec Hotel and catering where he did a course in cookery. Because the cooking industry at that time required hard work, most of his friends dropped out of college. But he was too focused that he never gave in to the pressure. That is how he found himself working at some of the UK’s best hotels as executive chef. He worked at hotels like Holiday Inn, London Sutton 4, Carlton Mite Hotel 4, Kinston Lodge Hotel 4, Ramada Guilford Hotel 4, and a private health facility called Ashtead Private Hospital where he prepared foods to meet requirements of individual patients. His first contact with Africa was in South Africa where he worked at a number of hotels. His most memorable and interesting time in his life was cooking for the Obama family while he was working at a hotel in South Africa, as well as cooking for some big celebrities on their private jets. “The thrill of having to cook for the Obama family when they visited South Africa was one of the best moments. It was most memorable. They seemed to like my food and I remember Michelle Obama even sent me a letter of thanks just for enjoying the food I had cooked. “I also had the privilege of cooking for celebrities on their private jets such as 50 Cent, Mark Damon, Morgan Freeman, Clint Eastwood, the Beckhams, Nelson Mandela, Jacob Zuma, Winnie Mandela, Elton John, the Saudi Arabian Prince, Paris Hilton and many more,” he said. He said having the chance to work with such big names always adds to the level of confidence as he carries out his work at all times. Darryl then moved to Zambia in 2013 where he worked at David Livingstone Safari Lodge and Spa5. 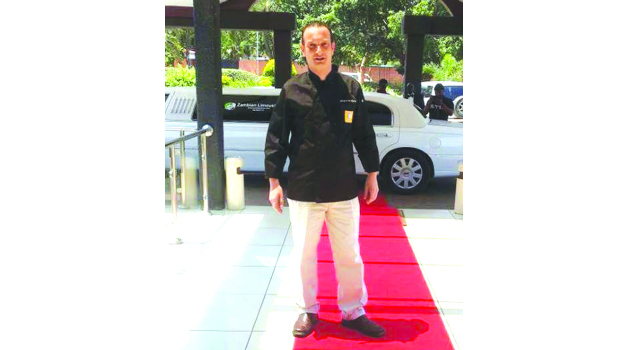 While in Livingstone, he was given the opportunity to work as head chef at Thorntree River Lodge where he also helped to train members of staff. Darryl has adapted very well in Zambia due to the people’s inviting nature. “The people in Zambia are very friendly wherever you go, and that really helped me to settle down when I first came here. Even in Livingstone, it’s the same as Lusaka and that’s a very good spirit to have at all times because it invites new people to a nice country like this one,” he said. He later moved to Lusaka’s Radisson Blu Hotel where he says the environment is very much more conducive for his kind of work. But it has not been all roses for him as he has had some challenges with regard to the availability of farm produce and staff communication in both Livingstone and Lusaka. “It was a little tricky when I was in Livingstone, specifically in terms of sourcing the farm produce like vegetables and other supplies for the hotel. I found that the availability of produce here in Lusaka was very different form Livingstone. Here in Lusaka, being the capital city, seems to have a variety of super markets that readily supply these greens. “Another challenge I had and still have is that of communicating to my fellow chefs. I have to say I speak very fast due to the British accent, and so most people find it hard to get what I am saying,” he says. He explained that its was for this that he and his staff chefs hold meetings from time to time to try to re-analyze most instructions so that they could be clear on most issues of duty. “It’s not about me but about all of us, and we let them experiment things so that they know how to execute things properly,” he says. Darryl is astounded by the work ethic of Zambian people who consistently give in their best while they work. His most exciting moment while in Zambia was contesting for the first ever Mastercook Zambia in Zimbabwe which he won to become the best chef in southern Africa. He found the different rounds of the competition very exciting but however, singled out the Matebeto challenge which he finished first. The Matebeto challenge involved preparations of traditional foods such as chiwawa, village chicken and some kidneys on the side. Darryl spends his spare time relaxing and watch movies, Formula 1, as well as watching cooking shows on television, such as Iron Chef, Chopped and Jamie Oliver. He praised the Jamie Oliver show for changed things in the way the presenter positively applies his cooking. He said watching such shows keeps him up to date with new styles of cooking. Darryl says although his family is a supporter of Fulham Football Club, he only takes interest in the English national team. But he also follows a bit of rugby. Darryl believes Zambia has the potential required to build young mature chefs that could contribute greatly to tourism in the country. He says Zambia needs more colleges that offer good catering courses and training for young aspiring chefs as well as funding in order to facilitate the process. In Cape Town, Darryl used to invite people to cook under his supervision for a day, just to offer some level of training. It is his wish that the Government could realise that having good chefs is a process that involves investment in terms of providing good training programmes to ensure that young chefs get the right training needed, coupled with resources. Darryl’s number one objective is to make Radisson Blu to become a leading hotel in the country and to train the chefs under his supervision so that they get better.